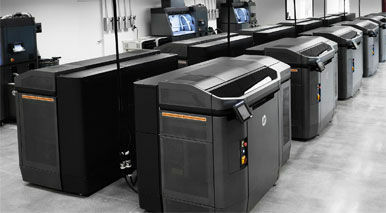 Above: HP’s Multi Jet Fusion 3D 4210/4200/3200 Printing Solutions. These 3D Printing solutions allows companies to prototype and produce functional parts up to 10 times faster and at half the cost/Image Credit: HP Inc. Accelerating digital transformation of manufacturing further, HP Inc. one of the leading providers of additive manufacturing solutions showcased its Multi Jet Fusion 3D printing solutions and announced new customer deployments of its cutting-edge Multi Jet Fusion 3D printing solutions at the ongoing Additive Manufacturers User Group (AMUG) – the world’s largest 3D printing event for users. Announcing how many of its customers are increasing capacity of its Multi Jet Fusion 3D printing solutions to meet the rising demand for production grade 3D printing products, the company announced that different companies such as Forecast 3D, GoProto and Stern were increasing their existing capacities of HP’s MultiJet Fusion 3D printers to scale production and meet rising demand from their customers. According to an official release by the HP Inc., Forecast 3D – one of the largest privately-held 3D manufacturers in the United States is upgrading its full fleet of 12 HP 3D printers to HP Jet Fusion 3D 4210 systems to help the company meet the rising demand. Forecast 3D aims to produce more than one million Multi Jet Fusion parts in the coming year for one of its leading clients operating in the medical sector. Above: The HP Jet Fusion 3D 4210 Printer a part of the company’s overall Multi-Jet Fusion 3D Printing Solutions is ideal for manufacturing environments producing 700-1000 parts per week/Image Credit: HP Inc.
HP, Inc. also announced that GoProto – a company that offers quick-turn rapid prototyping via custom manufacturing processes and caters to 500 plus clients across multiple industries has also installed six HP 4200 3D printers to meet its increasing demand for high-volume prototyping and robust production applications. A conventional manufacturing firm, Stern catering to medical and automotive companies is also anchoring its new service bureau entity with HP’s Multi Jet Fusion Technology. Known as Stern 3D, the bureau will install 10 HP Jet Fusion 4200 3D printing solutions in its production facility in Stuttgart, Germany. In addition to showcasing its new large-scale customer deployments, HP also showed how its reinventing itself with its own Multi Jet Fusion program to leverage its own 3D printing technology to lower costs, speed time to market, increase customer satisfaction, and improve sustainability. As one of the leading designers, manufacturers, and distributors of products in the world, HP announced that it is using its own Multi Jet Fusion across its Print, Personal Systems, and 3D Printing business units. Through its program and thanks to 3D printing which makes lightweight design possible, the company is already reaping 3D printing benefits which include reduced warehousing and transportation as a result of on-demand production, reduced scrap because of better supply/demand control, reduced material consumption and increased material recyclability, and reduced fuel consumption of the end product in industries such as auto and aerospace. “This unique program brings together product design, engineering, procurement, supply chain operations, and manufacturing to unleash the potential of Multi Jet Fusion. Embracing the design freedom of 3D printing, HP is making breakthroughs in cost, productivity, quality, and performance as we digitally reinvent our product lifecycle and supply chain,” added Pann. Customers are leaning in, driving improved economics, and increasing production of industrial-grade parts – in the last year alone more than three million parts were produced on Multi Jet Fusion and more than 50% are for end use. As one of the largest manufacturers in the world, HP is also leveraging our own technology to transform our product development lifecycle to help lower costs, speed time to market, increase customer satisfaction, and improve sustainability across our business,” Nigro added.